Mother Nature’s wonderful creations are some of the best subjects for photography. Mighty waterfalls, sheer cliffs, mountains that stand with their heads in clouds and of course stars. Speaking of stars, our own Milky Way galaxy is a wonderful subject to photograph, given the right tools. Unlike the older days when sensors had trouble picking up things against the backdrop of the pitch black night sky, modern cameras, chiefly the DSLRs have become more powerful than we’ve ever imagined. Thanks to technological advances it is now possible to photograph the Milky Way in all its glory on a clear black night. Here are a few tips how on how to do it. A DSLR camera is a must have. MILCs with full frame sensors such as the Sony Alpha 7 could be used too. Anything with a big sensor and a manual mode would do really. A tripod is a must too. Ensure that it can be extended to at least 6’. Unless you are super-tall that should allow you to look up through the back of the camera. Remember slouching for long hours is not going to do any good to your back. Lens can be any really. However, a wide angle lens will allow you to capture a big slice of the night sky. However, ensure that the lens has a fast maximum aperture. It is absolutely non-negotiable. Optionally, you could get a cable release so that you can save the exposure from any shake having to keep the shutter button pressed down manually. Otherwise use camera’s self timer. There are some useful software and apps that can really make a difference to your Milky Way photography. Star Walk Astronomy Guide for example is an excellent tool that tells you where the Milky Way will appear on the sky. Currently this app is only available for iPhones and iPads. The final tool is an image editing software and Adobe Lightroom is a good one. We shall come to its uses later. It must be a dark night with absolutely no ambient light from the city or the surroundings. No street lights or car trails in the frame otherwise it will ruin the shot. Check the lunar phase and ensure it is a new moon night. Set the camera on the tripod, lock focus and then switch to manual focusing. Set the lens on aperture priority and select the brightest f-stop you have. Let’s say you have f/1.8. Select that to ensure that your camera can pick up enough light to capture the distant stars. Also ensure that the camera is set to shoot in RAW instead of JPEG. This will allow you to recover details during post-processing. The exposure should be for a minimum of 30 seconds. You can tinker with it depending on the results.The best way to approach is by starting with the 500 rule. Here is a spreadsheet that will explain the rules. The actual process of photographing will require you to tweak the ISO, shutter speed and aperture intermittently and take plenty of photos to finally come to a few settings that you feel works for you. 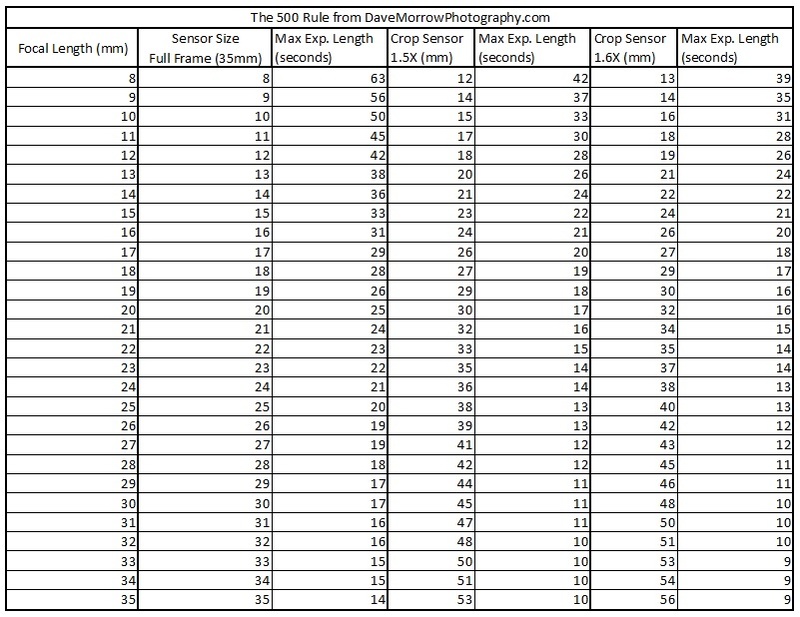 Some photographers recommend cranking the ISO to 2000-3000 or even higher. You will need to consider the noise factor and check the results after each shot. A bit of post-processing will be required to give your image the final look that is going to induce a “wow” from others. This includes color correction, noise reduction, sharpening and of course converting the RAW image to its final JPEG format. All this is done in Adobe Lightroom.